A two-and-a-half month-old human fetus, forgotten for more than 50 years in the basement of the Pacific Grove Museum of Natural History, has been brought to light. How long it has actually been in the basement is still a question. The fetus, preserved in solution in a specimen jar, is labeled simply “ossification classification.” There is no date and no catalog number, and more importantly, no record of the fetus in the Museum archives. Museum Foundation employees have been going through storage lockers and cabinets in the Museum’s basement over recent months, as part of conducting a meticulous inventory of every one of the more than 53,300 objects on display and in storage. As employees go through the inventory, they check records and catalogue each item in the Museum’s collection. Monterey Fire Chief San Mazza, who became Pacific Grove’s fire chief when the two departments began a shared services agreement a little more than a year ago, has announced his retirement effective December 17, 2010. Mazza, 59, has more than 32 years of fire service experience including service with the California Department of Forestry. He has no concrete plans for his retirement, though he says he plans to stay in the area. He lives in Salinas with his wife and middle school-aged daughter. “I want to be helpful somewhere,” he said. “I’m open to anything. Mazza said he hopes to see a decision, even an interim one, on the JPA for fire services for the Monterey Peninsula before he retires. He’s willing to stay on as a consultant to help it happen. His successor is former Pacific Grove Fire Department Chief Andrew Miller, now Assistant Chief of Monterey Fire Department. Miller is 51. He has more than 30 years in the fire service, 25 with Pacific Grove and nearly two with Monterey, and brief stints with Cal Fire and Tri County Fire. He lives in Pacific Grove with his wife and four children; Maryn, John, Eric and Zack. Fred Meurer, Monterey City manager, made the public announcement Nov. 5. Two state officials have issued proposed decisions, viewed as very important steps on the road to completion of the Regional Water Project. The decision could modify the proposed Settlement Agreement among the parties and hopefully result in approval of the Regional Water Project. Both officials recommend approval of the desalination project agreement as the most feasible way to provide water for customers of California American Water, the utility most of the Monterey Peninsula; but there are some differences in how they suggest that project go forward. After a series of public meetings and input by Cal Am, Marina Coast Water District and the Monterey County Water Resources Agency — the three “partners” to the project — PUC Commissioner John Bohn and Administrative Law Judge Angela Minkin issued the rulings last week. Judge Minkin is the presiding officer in the proceeding while Bohn is a commissioner on the Public Utilities Commission. Lowering cost caps and limiting cost recovery from customers in the event of cost overruns are two of the proposed changes. In fact, Minkin suggests that Cal Am be prohibited from charging customers for cost overruns for the Cal Am-only facilities. She suggests a capital cost cap of $95 million (which was the most probably estimated cost of construction) with an absolute cost cap of $106.875 million. Costs over that absolute cost cap could not be charged back to ratepayers according to Minkin’s proposal. I had my heart broken again today. Nothing to do with lovers or death or any of that sort of thing, so you can keep reading. No, my heartbreak had to do with people. I had been doing some fall cleaning, sorting out the detritus of another lifetime, dividing my unwanted items into stacks and piles. Keep, repair, recycle, donate, put in the trash because who would want this stuff anyway? When I had amassed a goodly amount of “donate” items, I piled them in my car and headed for my favorite local charity shop. Oh, I patronize them all, but this is the one where I donate my good ol’ stuff because I like what they do with their proceeds. All the local thrift stores — and this one is no exception — put their more valuable items up front, near the clerks and behind glass. Jewelry, knick knacks, collectibles and have-to-haveables, all right there where I have to see them when I bring my donations by. They know my weakness, which is watches. There’s a little item on the Pacific Grove City Council Agenda for Oct. 7, 2010 that most people will merely glance at. It’s a mere resolution, placed on the consent agenda because it’s not controversial and, having been through committees and the proper bidding process, probably needs no more scrutiny. It’s the story of how it got to the City Council that is interesting. And it points to the fact that the Campaign of Crankiness, as council member Lisa Bennett termed it, is not over. Not by a long shot. The item is about awarding a contract to paint the Pacific Grove Museum of Natural History. The City has agreed it’s responsible for the building while the Foundation takes care of the day-to-day running of this venerable institution. We, the citizens of Pacific Grove, own the building and the collection, the Foundation meets the payroll and puts on the exhibits. Simple, right? The Museum, looking a little seedy, needs a paint job. Put it out to bid and then vote on it and paint the darned Museum. Staff estimates the cost at $25,000 and we have a contractor who meets our requirements who bid the job at $13,750. Add a little for the contingencies, and voila! The Museum gets a badly needed paint job, under budget. Simple. Christopher Veloz, the 19 year-old accused of hosting a party where minors were served alcohol (against a Pacific Grove city ordinance), has pleaded no contest to the misdemeanor charge and, in an agreement among the defense attorney, the City’s attorney and the judge was sentenced to six months in county jail, suspended for one year provided Veloz submits proof he has finished 40 hours of community service by Jan. 7. The case will likely be reviewed in September and Veloz may seek to have the suspended sentence lifted and the misdemeanor conviction converted to an infraction. An impressive group of 15 candidates applied for the two vacant positions on the PG City Council. All care for the city, and each has something to contribute. Many have said that they will consider running for the city council in November, 2010. Here’s a look at those candidates and what they said on their resumes. Watch this space when filings begin for the 2010 elections. We present them in the order they were presented to the city council, which was a random choice by the deputy city clerk and the city attorney. No coin flipping this time, but it took five roll call votes for the sitting councilmembers to finally seat Ken Cuneo and Robert Huitt to fill the vacancies left when Vicki Stilwell resigned and Carmelita Garcia was appointed mayor to fill Dan Cort’s position. And no wonder — there were 15 very qualified candidates, any one of whom would be an asset to the city. It took three rounds of nominations and votes to appoint Cuneo, and when the council appeared (on the fourth vote) unable to garner the four votes necessary to fill the vacancy left, they swore Cuneo in and added his vote. He promptly nominated two additional candidates — Dan Miller and Richard Ahart, both of whom ran unsuccessfully in the November, 2008 election with Cuneo — but when it came down to the vote, Cuneo went for Robert Huitt, as did the rest of the council. Huitt previously served on the council for eight years but was ‘term-limited’ out seven years ago. Pacific Grove’s Community Development Department (CDD) set a goal of “preserving services through the economic storm,” meaning that, after large budget cuts, staff layoffs, contracting with other agencies, reducing staff by 43 percent and instituting voter-approved taxes, there is still a budget gap of $1.5 million. One area being examined is the large general revenue subsidy for fee-based services that Pacific Grove has, particularly in the planning department. Staff estimates that 73 percent of the cost for service, on average, is borne by General Revenues – the public. At its July 14 meeting, the Traffic Safety Commission decided to ask staff undertake a study of the intersection of Fountain Avenue and Gibson Avenue. Gibson had previously been designated a through street from Eardley Avenue to Alder Street while traffic on cross streets, including Fountain Avenue, were required to stop at Gibson. “A lot of times people (traveling on Fountain) think that you (traveling on Gibson) are coming to a stop,” said resident Karen Sheppard at that meeting. She also expressed concern for middle school students going home at the end of the day. Conversely, there was also testimony that traffic on Gibson does, in fact, stop as if there were already a stop sign there. Staff took traffic counts, a peak-hour hand count and an accident analysis. They noted that the presence of many senior citizens from Canterbury Woods and Forest Hill Manor, the presence of a medical office and the fact that the area is a walking route for students from Robert Down and Pacific Grove Middle School result in higher than expected vehicle traffic and pedestrian traffic at the intersection. The installation of four-way stop signs at the intersection was approved on the consent agenda at the city council’s September 16 meeting. Jack Beigle was the first to report a Monarch sighting in Pacific Grove — a single “scout” seen last week. “It would be interesting to know if the Monarchs sort of glide down a freeway route to the Sanctuary, or if it is a random distribution of arrival all over town” said Helen Johnson of Monarch Alert. Anyone spotting a Monarch in Pacific Grove over the next few weeks is urged to call Monarch Alert at 1-877-7740, Mailbox 7. If the butterfly is tagged, the tag number would be helpful but it is not vital. Or spotters may call Cedar Street Times at 831-324-4742. We’d like to know where it was seen. Monarchs were seen last week in coastal Marin as well. There were five sightings in one day at Muir Beach and three in the Marin Headlands. Debt service on the 1990 Butterfly Habitat Bonds has come up again, and the City Council voted unanimously to renew the special property tax with a levy of .004 percent on assessed value. Based on a median assessed valuation of about $260,000, a property in Pacific Grove would pay $10.40 per year at that rate. The funds can only be spent on debt service of the Butterfly Habitat Bonds, which were issued in 1990 to acquire and rehabilitate the Monarch Sanctuary. “This model will cost approximately $150,000 less than an in-house model,” said Jim Becklenberg, Director of Management and Budget. He also indicated in his staff report that a contract service model such as the one be proposed following with the City of Monterey would afford Pacific Grove more flexibility and take less time to implement than would an in-house model. Another factor in the decision was the need to provide continued customer service at a level that Pacific Grove’s people have come to expect. The current, interim model uses a contract with Monterey for Chief Building Official services. Monterey also provides plan check services. Building inspection services are provided with an outside company, Precision Inspection company, Inc. City staff performs application intake duties, while every aspect is overseen by the City’s Chief Planner. Back in April, the City Council was shown proposals for contract services and opted to accept the proposal from the City of Monterey while continuing the interim plan until now. Becklenberg told the Council that he and staff are confident that Monterey will provide the full range of services requested in Pacific Grove’ request for proposals, and in fact will improve on some areas. Staff the building counter at Pacific Grove City Hall with certified building technicians/inspectors from 8:00 a.m. to 12:00 noon, Monday through Friday. Provide service at Monterey city Hall building counter from 1:00 p.m. to 5:30 p.m. Monday through Friday. Chief Building Official will be provided an office and work from Pacific Grove City Hall as needed. Plan check will take place at Monterey City Hall. Pacific Grove performance standards will be met for plan check and building inspection. Pacific Grove’s trained building inspector will become Monterey’s building inspector, offering a seamless transition. Monterey will receive 75 percent of related permit revenue with a minimum of an $84 plan review fee. The agreement will be effective from September 1, 2009 through June 30, 2013 with a 180-day termination required. With revenues expected to be $364,000 for fiscal year 2009/10, and a total cost of $402,000 for the contract services, the cost to Pacific Grove would be $129,000 after subtracting $273,000, which represents the 75 percent of the permit revenue retained by Monterey. The Pacific Grove City Council has approved a resolution declaring a fiscal emergency requiring the urgent enactment of a special parcel tax to “preserve the public health, safety and welfare” of Pacific Grove – to wit, save the library. The legal declaration of the existence of a fiscal emergency is not required to place the special tax on the ballot but was directed by the city council at its July 15, 2009 meeting. The city council voted to call a special election. Stunning his constituents – and most of the rest of the Monterey Peninsula — Mayor Dan Cort has offered to resign in the face of what appears to be a narrowly based recall effort on the part of some disgruntled citizens. 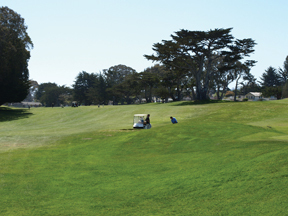 Without sufficient reserves, Pacific Grove faces a cash-flow problem. In the long term, property tax revenues will enable the City to meet its financial obligations, but not until November. And the City has bills now, as it does every year. Normally, the City applies to a pool of similar communities for a “Tax Revenue Anticipation Note,” or TRAN, which is a short-term loan, funded by selling the note on the open market, and which bridges gaps in cash flow. But this year, the TRANs did not sell on the open market, partly due to California’s reputation for fiscal crisis. While they are expected to sell in about 30 days, Pacific Grove will reach deficit levels by the end of July without interim funding. Director of Management and Budget Jim Becklenberg presented options to the City Council at the July 15 meeting, and on a 4-2 vote the Council approved the option for internal borrowing – borrowing from other funds the City has on hand and which are not needed before tax revenue comes in. The worst case includes a property tax takeaway of $451,000. While essentially a loan which would, by state law, have to be repaid within a three-year period, such a takeaway would still have a major impact on the City’s ability to provide services. Gas Tax revenues in the amount of $240,000 per year are used by the City to pay a portion of street maintenance workers’ salaries and street lighting costs. If the State suspends these revenues for cities, which has been recommended by the Governor and the Legislative Analysts Office, those revenues would then be replaced by General Fund monies. Prop 42 funds are also up for grabs by the State. TAMC, the Transportation Agency of Monterey County, passes through these sales tax on gasoline funds for which Pacific Grove’s allocation is $146,000, the loss of which would reduce the amount of maintenance that Pacific Grove could do. CalPERS Board has changed its rate-setting policies. The City can now expect a 1 percent increase in FY 2001/12, 3 percent in FY 2012/13, and 5-6 percent in FY 2012/13. In the parlance used repeatedly by various speakers at the City Council meeting on July 15, this is merely “kicking the can down the street,” only to have to kick it again later. Monterey City Manager Fred Meurer has advised Pacific Grove’s Interim City Manager Charlene Wiseman that Monterey will likely refund a portion of Pacific Grove’s 2008-09 payments for fire protection because of cost savings that the Monterey Fire Department was able to achieve in fiscal year 2008-09. Meurer advises that the amount may be as much as $100,000, and that more accurate numbers will be available next month, in august. In addition, Meurer states that there will be a reduction of $167,800 in the charges to Pacific Grove for fiscal year 2009-10 as a result of cost savings efforts made in Monterey and Pacific Grove, and he has directed his staff to reduce the monthly charges Pacific Grove pays as a result. He is also projecting a reduction of $281,000 in charges for fiscal year 2010-11, partly as a result of recognition that Pacific Grove’s reserve fire apparatus have been used “disproportionately” to assist Monterey while Monterey suffers mechanical problems with their own fire apparatus. Monterey anticipates that it will need Pacific Grove’s reserve equipment for the better part of a year while they await the building and equipping of a new fire engine. A fire engine can cost from $50,000 to more than $750,000. The National Fire Protection Association (NFPA) has compiled guidelines for apparatus design based upon review of the anticipated hazards and geographical terrain of the area the fire department will service, as well as other variables. Other factors may include ease of operation response speed, equipment storage and equipment deployment. The manufacture of a fire engine remains a custom, almost one-of-a-kind operation. Typically, a group of workers is assigned to the fabrication of the body and assembly of the truck frame. A separate group performs body finishing, then the apparatus is wired, equipped, and tested by a third, or “equipment,” group. Pacific Grove Museum Foundation member Judd Perry told the City Council that he and other volunteers have spent what amounts to thousands of hours working on details of an agreement between the newly-formed foundation and the City of Pacific Grove to form a public/private partnership operating agreement and lease for the Pacific Grove Museum of Natural History. The agenda item which received more public discussion than cuts to library funding at the recent City council meeting was the proposed fee schedule for the golf course. There were no real surprises on the City’s proposed budget for 2009/10, which was unveiled at the City Council meeting May 20. But there were some new issues. In last week’s issue we reported that, faced with a $1.3 million budget gap, Pacific Grove’s City Council and staff are examining ways to meet the shortfall through a combination of expenditure cuts and revenue enhancements. We dealt with some of the proposed cuts last week. they include staff furloughs and pay cuts, “defunding” of some vacant staff positions, service reductions such as the city’s website and tree maintenance. The possibility of further cuts to the already-strapped Museum and Library were also mentioned, though no one on the Council seemed to be in favor of the idea. Director of Management and Budget Jim Becklenberg reported at the March 4 City Council meeting that City staff anticipates a $1.3 million budget gap for the coming fiscal year. He was directed to return with ideas for revenue increases and for cutting expenditures.